My family has an unusual Christmas Eve tradition. Every year, we eat a 12-course Chinese banquet with our neighbors. Between both our families, more than a dozen of us easily fill the restaurant’s large round tables. The courses are brought out one or two at a time and placed on a large lazy susan in the middle of the table, allowing us to help ourselves to a bite without having to leave our seats. Tea flows endlessly, stomachs are filled, and we eventually leave to cruise for Christmas lights. 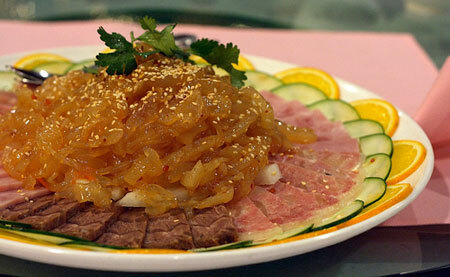 Appetizer plate with jellyfish and cold cuts. Photo by Jeremy May. Here’s what was on our menu this year. Our neighbors order in Chinese so I don’t know the exact names of the dishes, but I’ve tried my best to be descriptive. If you want to see more of the food, check out Jeremy’s photos. And if you want to experience it first-hand, the restaurant we went to for the last two years has been Majestic Restaurant ( 29 Route 23 S, Wayne, NJ), which also offers buffet-style dining.